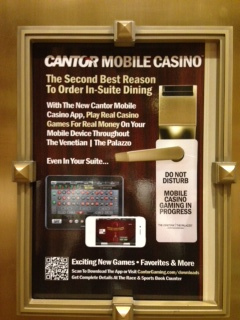 I just came home from Vegas and can’t wait to share my observations from CTIA Wireless. This show is the largest event in the USA dedicated to mobile communications and in the past used to be a huge expo area where phone manufacturers (Nokia, Samsung) and network vendors (Cisco, NSN, Ericsson) used to demo their gear and latest handsets. That was back in 2010 where the whole mobile ecosystem was operator centric and very closed. With the arrival of app stores, social networks, tablets and more reliable network connections the landscape and focus of the show has evolved to include user experience personalization, analytics, mobility for retail as well as marketing strategies for hyper connected world. 1. Users are spoiled, they demand more and will not settle for less. 2. Apps are getting more complex. – Let the case studies / customer stories speak for effectiveness of your solution/product. 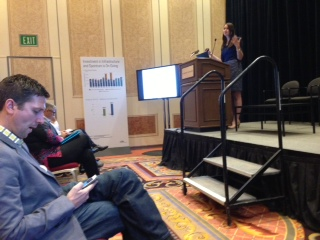 During a Forrester when the speaker introduced their mobile marketing framework people were playing with their devices but the moment she switched to examples of how Chevy and Mint dentistry successfully applied the framework to drive customer loyalty and delight, all the audience eyes were on her. 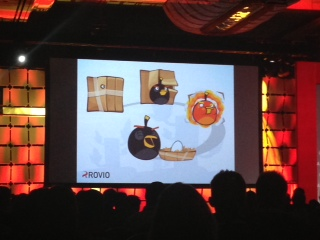 – Deliver on your promise when presenting; as Angry Birds’ godfather, Harri Koponen stated on stage: “In Finland we start a presentation on time and we finish on time. Otherwise people get bored”. And how do you achieve that? Preparation and practice, as: “An outstanding 1h presentation can take up to 30h prep time”. Thanksgiving weekend is about to start and so is retail sales time. Two years ago US consumers spent over $1bn on Cyber Monday – more than any other big sale day in 2010. If you live in San Francisco and have been procrastinating your 4G smartphone purchase till the holidays, be sure to analyze this AT&T vs. Verizon performance guide before you swipe your credit card on Monday! Looking at the top spots in the city featured in the performance chart above, you quickly notice there is not an ultimate winner in the Silicon Valley mobile Internet battle. If you like to hang out and stream Katy Perry’s videos around Union Sq, AT&T with half the theoretical top LTE speed is your preferred carrier. If you rather watch Giants’ game while indulging some fresh crabmeat at Fisherman’s Wharf, you should go for Verizon. 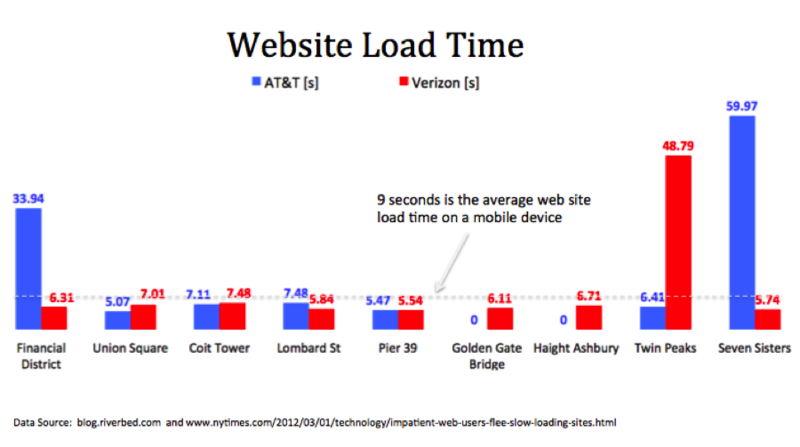 Interestingly enough, despite over 21 Mb/s download speed on AT&T network in the Financial District it can take around 34 seconds to load New York Times website on an iPhone 5. That’s almost 4 times slower than the average website load time on a mobile device. 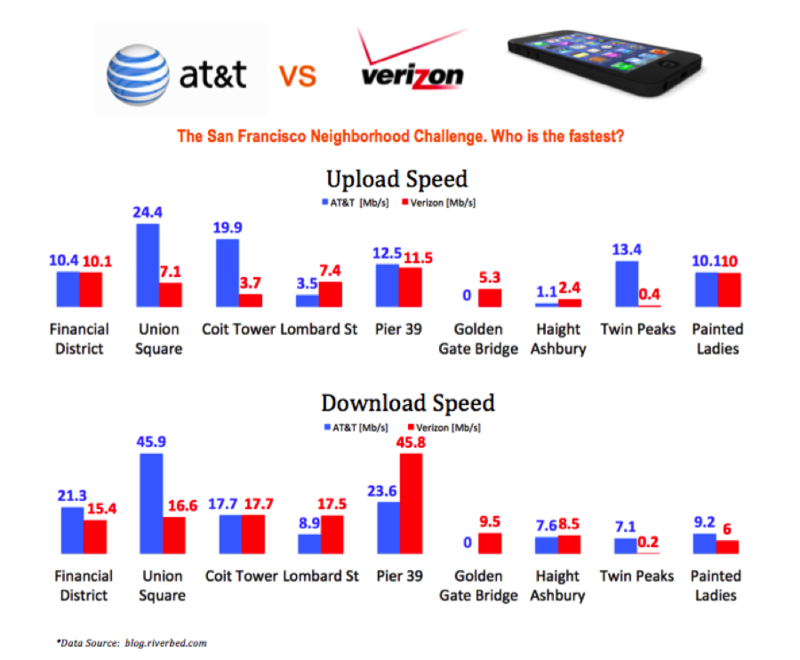 ATT vs. Verizon performance result prove that user experience with mobile Internet cannot be measured purely in Mb/s. How to make Internet websites load faster on mobile devices? Look for the answer in the next blog post.